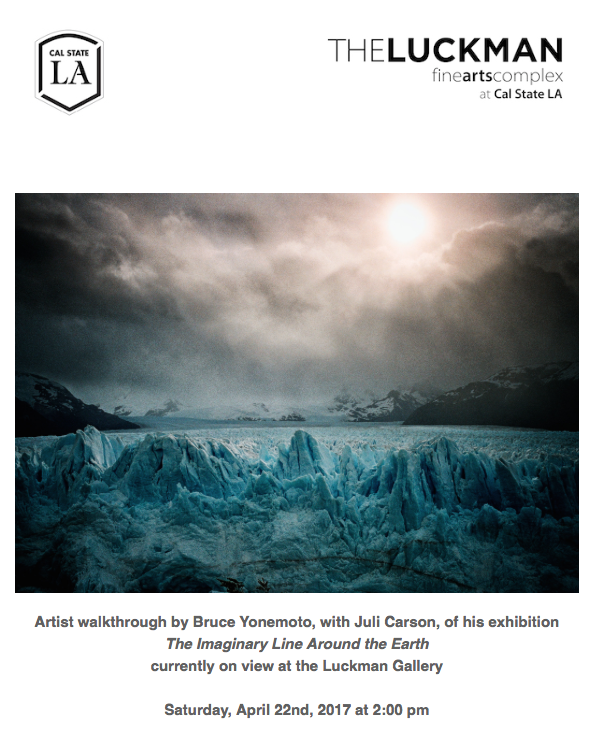 The Luckman Fine Arts Complex at Cal State LA invites you to a walkthrough of the exhibition The Imaginary Line Around the Earth with artist Bruce Yonemoto and Juli Carson; historian, critic, curator, and collaborator on Yonemoto's most recent project, The End of the World at the Edge of the Earth. The selected works correspond to a series of work Yonemoto has captured and created over the past 25 years from his travels to South America. Much of his work examines the unreality of the media landscape, a landscape that distorts and manipulates our understandings of important and shared issues such as class and race. Yonemoto will also debut his most recent project, The End of the World at the Edge of the Earth, filmed in Argentina. Yonemoto has been honored with numerous awards and grants from the National Endowment for the Arts, the American Film Institute, The Rockefeller Foundation, and the Maya Deren Award for Experimental Film and Video. He has had solo exhibitions at Alexander Gray Gallery, New York; Blum & Poe, Los Angeles; Tomio Koyama, Tokyo; Galerie Quynh, Ho Chi Minh City and his work was featured in Los Angeles 1955-85 at the Pompidou Center, Paris; the Generali Foundation, Vienna; the 2008 Gwangju Biennial; Pacific Standard Time, Getty Research Center; and most recently the Tate Modern, London.